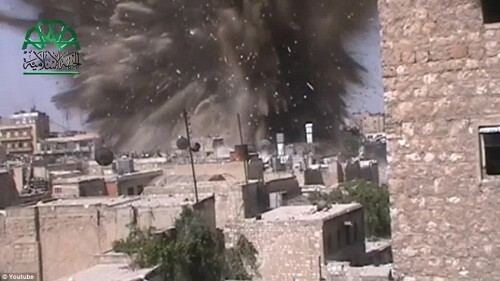 An underground bomb killed and wounded about 20 regime troops in Aleppo on Tuesday, according to activists. The sources claimed that the Shamiah Front, a new insurgent coalition in Aleppo, was responsible. In spring and summer 2014, a series of tunnel bombs in Syria’s largest city killed scores of Syrian troops. The city’s historic Citadel was damaged and a nearby hotel, converted into a headquarters for the Syrian military, was destroyed. In recent weeks, attention has been focused north of the city, where regime forces are trying to cut one of the last supply routes to the insurgents who control the eastern part of Aleppo. A Jordanian MP said on Tuesday that Amman has suspended military action against the Islamic State, after one of its pilots was captured by the jihadists. “This should not be a permanent decision, as I believe, but, perhaps, a kind of step back to think and reflect and get the deal done with,” Rula Al Hroob said. First Lieutenant Moaz al-Kasasbeh was seized by the Islamic State after his F-16 fighter jet crashed in northern Syria last Wednesday. He was later shown in a video by the group. A US defense official said Wednesday that there was no indication of a pause in Jordanian operations.